The small town in Buffalo in the north-west of South Dakota was so named as back in the 19th Century vast herds of buffalo (American bison), roamed across this part of the world. However, another type of horned animal has got local townsfolk excited, one that would have dwarfed even the largest of today’s hoofed giants, a very-well preserved partial skull and jaws of a huge horned dinosaur which might turn out to be a new species. Fossil collector and dealer Alan Detrich purchased the dinosaur skull found in Harding County from another fossil collector John Carter back in 2012, but it has taken more than two and a half years to prepare the specimen ready for sale. When the fossil skull and lower jaw were first excavated it was thought that the bones represented a very large specimen of Triceratops (T. horridus). However, with the fossil completely exposed, Alan along with Neal Larson (Larson Paleontology Ltd) who was tasked with preparing the fossil, believe that this could be a brand new species of horned dinosaur. The fossilised skull in its protective burlap and plaster jacket. Over the last fifteen years or so, a number of new North American horned dinosaurs have been named and described, however, if proved to represent a new species, this dinosaur skull could be heralded as one of the most spectacular dinosaur discoveries of all, the nasal horn alone measures nearly forty-five centimetres long and the skull itself is over 1.82 metres in length. Neal Larson, the founder of Larson Paleontology Unlimited and a co-founder of the Black Hills Institute of Geological Research with his brother Pete Larson, who coincidently is also working on a Centrosaurine specimen at the moment, was given the task of trying to prepare the specimen. It took over 1,000 pain-staking hours to carefully excavate the fossil from its iron siderite matrix. The preparation work was extremely difficult, as despite the robust nature of the fossil bones, the matrix with its iron component (iron carbonate) was extremely hard. Huge horned dinosaur skull could be a new species. For Neal, who holds a degree in geology and has been excavating fossils for some forty years now, the Ceratopsian skull represented a tough challenge given the hardness of the surrounding matrix. The skull has a strange ridge under the jaw, something that is not seen in Triceratops skull material. Mr Detrich is now trying to find a museum to house this specimen, preferably in the United States, potential buyers for this huge dinosaur skull are currently being contacted. The Ceratopsians of North American seem to have evolved into a very diverse range of forms during the Late Cretaceous. Some of the skulls of these herbivorous dinosaurs were truly immense. As a clade, the Ceratopsians are considered to have the largest skulls in proportion to the rest of their bodies of any known vertebrate. A few years ago, Everything Dinosaur reported on the discovery of another enormous horned dinosaur skull, this time from Alberta, Canada, a dinosaur that was believed to be an ancestor of Triceratops. Serendipity and palaeontology are often strange bedfellows, but luck does play a part especially when you consider the difficulties in finding very rare and exceptional items such as Early Jurassic dinosaur bones. Take the example of palaeontology student Sam Davis who has been lucky enough to have been in the right spot at the right time to find the fossilised foot bones of the first meat-eating dinosaur known from Wales. The bones belong to an, as yet, not scientifically described species of Theropod dinosaur found by brothers Nick and Rob Hanigan in 2014. The bones come from the Lower Jurassic strata exposed at Lavernock beach (Vale of Glamorgan). A significant proportion of the skeleton, including skull material, was found by the brothers after spring storms revealed the specimen last year. However, student Sam Davies decided to visit the beach to explore the fossil location after his tutor explained to him about the geology of the area and the nature of the fossils likely to be found eroding out of the steep cliffs. Sam duly arrived at Lavernock Point just a few hours after a rock fall had exposed the fossil. Had he decided to visit the site just a few days later, the fossil specimen would very likely have been washed away by the tide and lost to science forever. The bones are located on a 20 cm slab of rock. Third year student Sam, had visited the beach hoping for inspiration for his third year project as part of his studies at the University of Portsmouth, it looks like he has hit the jackpot with his lucky discovery. We suspect that Welsh Theropods are going to feature in his individual research project this semester. The fossil has been donated to the National Museum of Wales, joining the rest of the Theropod material. Sam’s tutor is renowned vertebrate palaeontologist Dr. David Martill, he has been tasked with the job of studying the Welsh fossils and producing a scientific paper on the 200 million year old dinosaur. Everything Dinosaur expects the paper, along with a name for this three metre long, meat-eater to be published next year. Sam admits to “jumping up and down like a little boy” when he realised the significance of his discovery. Third year palaeontology student Sam Davies. The fossil was actually found some weeks ago, but the announcement of this latest discovery coincides nicely with a television documentary being aired on ITV1 on Monday 31st August with part two the following evening. 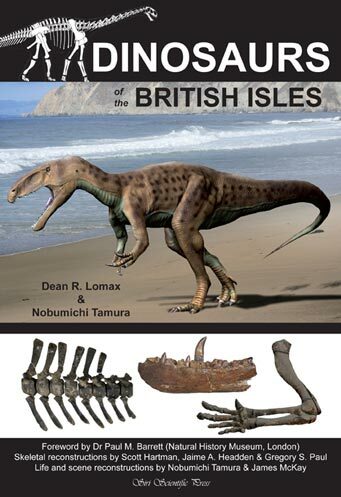 The documentary entitled “Dinosaur Britain” explores the rich dinosaur heritage of the British Isles and the Welsh Theropod is featured in the second programme of this two-part documentary. Here’s one palaeontology student who has helped to put Welsh Theropods on a firmer footing. A team of international scientists including researchers from Witwatersrand University (South Africa), have discovered the fossils of the earliest known baboon. The partial skull of a new species, which has been named Papio angusticeps has been dated to around 2.026 to 2.36 million years ago was found at Malapa, in the Cradle of Humankind World Heritage Site, which is located about thirty miles north-west of Johannesburg in Gauteng Province, South Africa. The baboon fossils come from the same site where the partial remains of the early hominin species, named Australopithecus sediba, were discovered in 2010. Commenting on the study, lead author Dr. Christopher Gilbert (Hunter College of the City University of New York), explained that the rise of the baboons was contemporaneous with the rise of that part of the hominin family tree that resulted in our own species. Various views of the baboon skull fossil. As one of the largest, non-hominin members of the primate Order, these intelligent animals would have competed with our ancestors for food, shelter and other resources. The skull fossil is very similar to that found in a modern baboon species, (Papio hamadryas), one of five species in the Papio genus and the species of baboon that lives the furthest north. Its range is from the horn of Africa across the Arabian Sea into the Arabian peninsula. Despite the record of baboon fossils from a number of hominin sites, the evolution of modern baboons is not well understood and the fossil record for these large Old World monkeys is very poor. In addition, the estimated age of the Malapa specimen (2.026 to 2.36 million years old), is an almost perfect fit with molecular clock analyses for the initial appearance of modern baboons. The skull may help to solve the evolutionary origins of these highly adaptive mammals. Furthermore, as monkeys are widely recognised as key time-sensitive elements in the fossil record, the fact that the Malapa P. angusticeps specimen is well-dated allows future studies to better estimate the age of fossil sites where the species is found. This may prove particularly helpful when attempting to date early hominin sites in South Africa. The presence of these baboon fossils, may be able to help scientists achieve more accurate age estimates for any early hominin remains found in situ.